WHEREAS, Congress has appropriated an amount of P57.91 Billion in Republic Act (RA) No. 10717 or the Fiscal Year 2016 General Appropriations Act (GAA), to cover the requirement to implement the compensation adjustment of civilian personnel and military and uniformed personnel in the National Government. e) Strengthen the performance-based incentive system in recognition of government personnel who play a greater role and carry a heavier responsibility in attaining performance targets and delivering results. 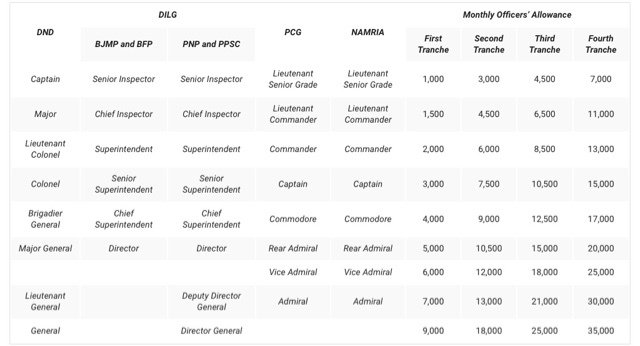 For the military and uniformed personnel (MUP), the compensation adjustment strategy shall be aligned with the objective of mitigating the fiscal crisis building up in their pension system and pursuing the pension reform. Section 2. Coverage. 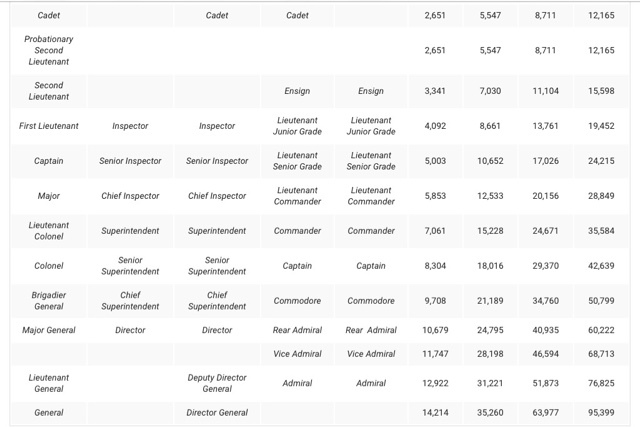 The modified Salary Schedule authorized herein shall apply to all civilian personnel in the Executive, Legislative and Judicial Branches, Constitutional Commissions and other Constitutional Offices, Government-Owned or Controlled Corporations (GOCCs) not covered by RA No. 10149, and local government units (LGUs); regardless of appointment status, whether regular, contractual or casual; appointive or elective; and on full-time or part-time basis. The new Provisional Allowance Schedule and the Officers’ Allowance shall apply only to the military personnel of the Department of National Defense (DND) and the uniformed personnel of the Department of the Interior and Local Government (DILG), the Philippine Coast Guard (PCG) and the National Mapping and Resource Information Authority (NAMRIA). The Mid-Year Bonus, Enhanced Performance-Based Bonus (PBB), and Productivity Enhancement Incentive provided herein shall apply to both civilian personnel, and MUP, except for the increase in Hazard Pay which applies only to the MUP. However, individuals whose services are engaged through job orders, contracts of service, consultancy contracts, and service contracts with no employer-employee relationship are excluded from the salary increase and benefits authorized herein. Section 4. Mid-Year Bonus. Beginning FY 2016, a Mid-Year Bonus equivalent to one (1) month basic salary as of May 15, shall be granted to those who have rendered at least four (4) months of satisfactory service and are still in the service as of same date, to be given not earlier than May 15 of every year. This shall be in addition to the Standard Allowances and Benefits under the Total Compensation Framework embodied in the Congress Joint Resolution No. 4 (s. 2009). 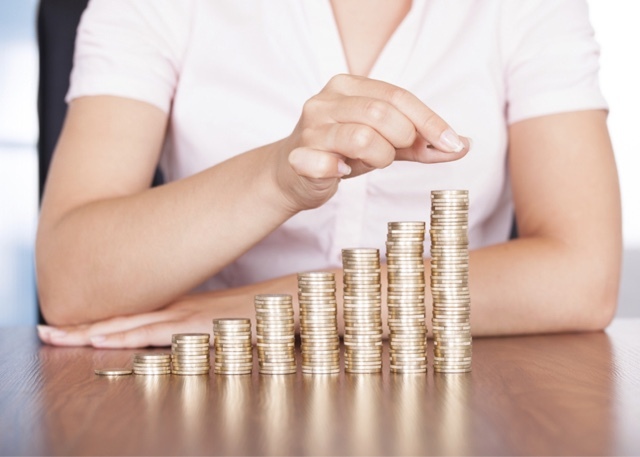 The existing Year-End Bonus equivalent to one (1) month basic salary and Cash Gift at prescribed rates shall be given in November of every year. Section 5. Enhanced Performance-Based Bonus. The existing PBB granted to qualified government personnel, including those in LGUs, shall be enhanced to strengthen its results orientation, to be given in an amount equivalent to one (1) month basic salary up to two (2) months basic salary, to be implemented in two (2) phases starting in FY 2017. The PBB shall be subject to the achievement by departments or agencies, including LGUs and individual employees of their performance targets or commitments and compliance with good governance and other conditions. The grant of the enhanced PBB shall be based on a progressive rate system. As the position and responsibility in improving agency performance becomes higher, so is the amount of PBB. The Inter-Agency Task Force on the Harmonization of National Government Performance Monitoring, Information and Reporting Systems created under Administrative Order No. 25 (s. 2011) shall prescribe the conditions on eligibility and procedures for the grant of the enhanced PBB, including the ranking system to recognize differences in levels of performance. Section 6. Productivity Enhancement Incentive. Beginning FY 2016, the Productivity Enhancement Incentive shall be given not earlier than December 15 of every year to all qualified government employees at Five Thousand Pesos (P5,000) each for the purpose of improving the government employees’ productivity. The Provisional Allowance shall be given as an interim measure to supplement the total compensation of MUP until such time that their Base Pay Schedule is rationalized in consideration of the pension implications of base pay adjustment of personnel in the active service under existing laws. d) By January 1, 2019, Eight Hundred Forty Pesos (P840) per month. b) Compliance with the Personnel Services (PS) limitation set under Sections 325 and 331 of RA No. 7160.
ii. The basic pay of barangay personnel shall be in the form of honoraria which shall not exceed the percentage of the Salary Schedule corresponding to the income classification of the LGU. They may likewise receive Mid-Year Bonus and Year-End Bonus based on the monthly honoraria as of May 15 and October 31 of the year, respectively, and Cash Gift of Five Thousand Pesos (P5.000). However, the minimum Year-End Bonus of One Thousand Pesos (P1,000) for the punong barangay and Six Hundred Pesos (P600) for other mandatory barangay officials shall not be subject to the PS limitation. Starting January 1, 2016, the first tranche salary schedule for civilian personnel and the first tranche Provisional Allowance, Officers’ Allowance and Hazard Pay for MUP, together with the Mid-Year Bonus. 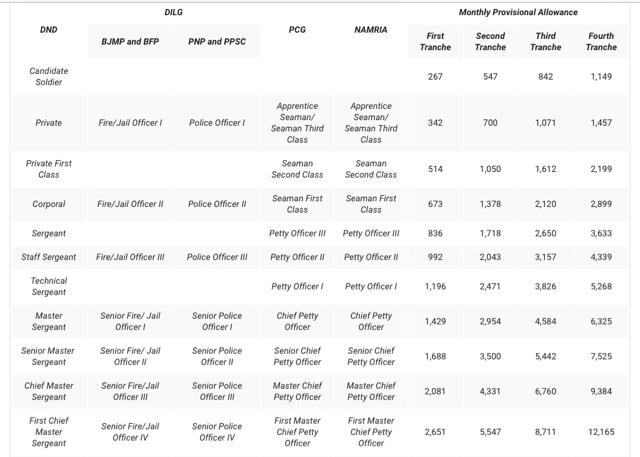 By January 1, 2019, the fourth tranche salary schedule for civilian personnel and the fourth tranche Provisional Allowance, Officers’ Allowance and Hazard Pay for MUP, the Mid-Year Bonus and full amount of the enhanced PBB. For covered GOCCs and LGUs, the implementation of the compensation adjustments shall be in at least four (4) years depending on their respective financial capability, with each tranche starting not earlier than the dates stated above. GOCCs and LGUs which do not have adequate or sufficient funds shall partially implement the modified Salary Schedule and authorized benefits. In case of partial implementation, the same shall be at uniform percentage across all positions for every GOCC/LGU. Section 12. Retroactive Application. The first tranche implementation of the modified Salary Schedule for civilian personnel, the grant of the Provisional Allowance, Officers’ Allowance and increased Hazard Pay for the MUP, shall be effective January 1, 2016. For covered GOCCs and LGUs, the retroactive application of the first tranche shall be subject to their financial capabilities and compliance with other requirements under existing laws. Section 13. Exempt Entities. The following exempt entities shall not be covered by the modified Salary Schedule and additional benefits authorized herein: (i) government agencies, including GOCCs that are exempted from the coverage of RA No. 6758, as amended, as provided in their respective enabling law or charter; and (ii) GOCCs governed by the CPCS established by the Governance Commission for GOCCs (GCG) and approved by the President of the Philippines, under RA No. 10149. They shall be governed by their respective CPCS which shall be made effective upon the recommendation of the DBM or the Governance Commission for GOCCs, as the case may be, and approval by the President of the Philippines. Section 14. Applicability to Certain Officials. Consistent with the policy under Section 6 of Article VII and Section 10 of Article VI of the Constitution, the salaries authorized herein for the President, Vice President and Members of Congress shall take effect only after the expiration of the respective terms of the incumbents. The implementation of this Executive Order with respect to the regular members of the Cabinet shall be effective starting July 1, 2016.
a) For national government agencies funded in the GAA, the amount needed for the compensation adjustment in FY 2016 shall be charged against the appropriations provided in the FY 2016 GAA. The funding requirements for the compensation adjustment in FYs 2017, 2018 and 2019 will be included in the proposed annual National Expenditure Program submitted to Congress for its approval. The DBM, following the compensation adjustment strategy embodied in Section 1 hereof, and consistent with its authority under Section 7 of RA No. 6758, as amended, shall then be authorized to implement or adjust the compensation corresponding to the appropriations provided in the GAA. b) For GOCCs, the amounts shall come from their respective corporate funds in the corporate operating budgets approved by DBM. c) For LGUs, the amounts shall be charged against their respective funds in accordance with the pertinent provisions of this Order and RA No. 7160. Section 16. Implementing guidelines. The DBM shall issue the guidelines necessary to implement the provisions of this Order. Section 17. Separability. Should any provision of this Order be declared invalid or unconstitutional, the other provisions unaffected thereby shall remain valid and subsisting. Section 18. Repeal. All other rules, regulations and issuances, or parts thereof which are inconsistent with this Order are hereby repealed or modified accordingly.. Section 19. Effectivity. – This Order shall take effect immediately upon its publication in a newspaper of general circulation. DONE, in the city of Manila, this 19th day of February, in the year of our Lord, Two Thousand and Sixteen.